Takaaki Nakagami heads to Motegi for his home Grand Prix having agreed an extension to his contract with the Honda HRC. It was confirmed this week that the Japanese talent had signed a new one-year deal with the Japanese Manufacturer riding with Lucio Cecchinello’s outfit in the 2019 MotoGP World Championship, having made his debut in the class this season with LCR Honda IDEMITSU squad. 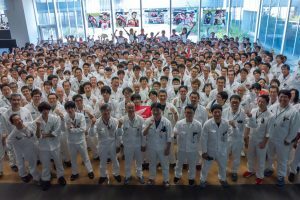 Nakagami geared up for the race at Motegi with a visit to Honda HQ in Aoyama (Tokyo) on Tuesday with fellow HRC riders Cal Crutchlow, Marc Marquez and Dani Pedrosa and at Honda R&D Department early this morning. 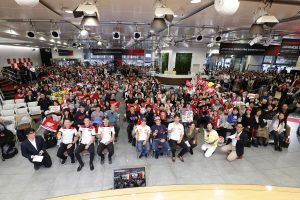 Big crowds gathered to meet the MotoGP stars and for Taka it was a great opportunity to mingle with his passionate home fans. The local hero also got the chance to introduce some of his fellow riders to one of his country’s great traditions on Wednesday as they visited Tokyo’s Arashio Heya (Sumo House). 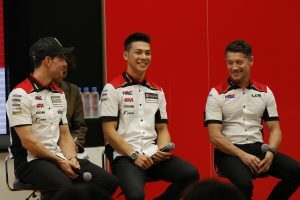 Along with Franco Morbidelli and Jorge Martin, Nakagami trained with the local wrestlers before stepping into the ring with them and learning some moves from the iconic sport. It capped off a busy start to what Taka hopes will be a successful few days on home soil. 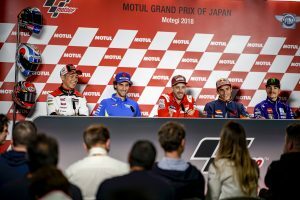 “As you know, this race is my home GP and I think we started the weekend in the best way announcing my renewal with Honda HRC and the LCR Honda IDEMITSU Team for 2019. 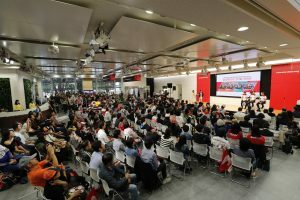 On Tuesday, with Cal, Marc and Dani we visited the Honda HQ for a Fan Event and I could feel the huge support of my fans. The same this morning when we visited the Honda R&D Department. I also experienced Sumo on Wednesday and it was very interesting… but very tough sport honestly. It’s going to be a very busy weekend for me, but I’m happy to be here and will do my very best to get a good result for my family and my fans”.